UPDATE: Journalist Released After Three Months By MARIAM FAM, (AP Writer) 5 minutes ago American reporter Jill Carroll was set free Thursday, nearly three months after she was kidnapped in a bloody ambush that killed her translator. She said she had been treated well. Carroll, 28, was dropped off near the Iraqi Islamic Party offices. She walked inside, and people there called American officials, Iraqi police said. "I was treated well, but I don't know why I was kidnapped," Carroll said in a brief interview on Baghdad television. Carroll was kidnapped Jan. 7 in Baghdad's western Adil neighborhood while going to interview Sunni Arab politician Adnan al-Dulaimi. Her translator was killed in the attack about 300 yards from al-Dulaimi's office. The previously unknown Revenge Brigades claimed responsibility. Even though the group threatened twice in videotapes to kill Carroll, she said, "They never hit me. They never even threatened to hit me." The Italian news agency ANSA reported that Carroll underwent a medical checkup at the American hospital in the Green Zone. During the TV interview, Carroll wore a light green Islamic headscarf and a gray Arabic robe. "I'm just happy to be free. I want to be with my family," she was heard to say under the Arabic voiceover. Carroll said she was kept in a furnished room with a window and a shower, but she did not know where she was. "I felt I was not free. It was difficult because I didn't know what would happen to me," she said. UPDATE: U.S. Risks Reporter's Life to Strike Tough Pose Published on Tuesday, February 14, 2006 by Inter Press Service by Gareth Porter - WASHINGTON - The George W. Bush administration went well beyond refusing to negotiate with terrorists in its handling of the threat by freelance journalist Jill Carroll's abductors to kill her if all female detainees were not released from U.S.-run prisons in Iraq. According to Iraqi officials, U.S. officials delayed the scheduled release of six female prisoners whom they knew had already been found innocent because of the kidnappers' demand for their release. Then they refused to speed up the review of the files of the five remaining female prisoners, in violation of a policy of giving priority to females in the review of detainee files for release. Had the normal policy been followed, it is very likely that all the women held by the United States would have been released by now. By delaying the releases of female detainees to strike a tough anti-terrorism pose, the administration has increased the risk to Jill Carroll's life. UPDATE: Kuwait TV: Carroll Kidnappers Set Deadline By PAUL GARWOOD, Associated Press Writer, Sat., Feb. 11, 12 minutes ago, BAGHDAD, Iraq - Kidnappers of American journalist Jill Carroll have threatened to kill her if their demands are not met by Feb. 26, the owner of a Kuwaiti TV station that has aired a new tape of the hostage said Friday. UPDATE: Kidnapped U.S. Reporter Appeals for Help By QASSIM ABDUL-ZAHRA, Associated Press Writer, Fri., Feb. 10, 2 hours 52 min. ago BAGHDAD, Iraq - Kidnapped American journalist Jill Carroll appeared in a video aired Thursday on a private Kuwaiti TV station, appealing in a calm, composed voice for her supporters to do whatever it takes to win her release "as quickly as possible." Jill adds, "I sent you a letter written by my hand, but you wanted more evidence," she said. "I am here. I am fine. Please just do whatever they want, give them whatever they want as quickly as possible. There is very short time. Please do it fast. That's all." UPDATE: New Video Shows Kidnapped Reporter Weeping By PAUL GARWOOD, Associated Press Writer Tue Jan 31, 12:35 AM ET BAGHDAD, Iraq - The U.S. journalist Jill Carroll, weeping and veiled, appeared on a new videotape aired Monday by Al-Jazeera, and the Arab television station said she appealed for the release of all Iraqi women prisoners. UPDATE: Five Iraqi women prisoners to be freed: ministry (1/25/06) UPDATE: Kidnapped reporter's father asks Iraq captors to open dialogue for daughter's release (1/23/06) American Muslims Step Up Appeal for Reporter's Release By Aishah Schwartz January 21, 2006 Arriving in Bagdad, Iraq on Saturday, Jan. 21, 2006, representatives of the Council on American-Islamic Relations (CAIR) Nihad Awad and Corey Saylor, hoped to play a pivotal role in the release of kidnapped freelance reporter Jill Carroll, 28, of Ann Arbor, Michigan. At Baghdad International Airport news sources state CAIR Executive Director Nihad Awad, as saying, "We are the only people who have come from outside of Iraq to call for Jill's release and we are very hopeful they will hear our message on behalf of American Muslims." In an earlier plea for Carroll's release CAIR officials also stated, "Journalists must be free to report on conflicts worldwide without fear of being targeted by combatants. We call for the immediate and unconditional release of Jill Carroll and for the release of all hostages held in Iraq. No cause can be served by harming those who only seek to convey the human suffering caused by war." Carroll, the first female American journalist to be kidnapped in Iraq and working there since October 2003, is said to have been on assignment for The Christian Science Monitor when she was abducted January 7, 2006 leaving the office Adnan al-Dulaimi, secretary-general of the Conference for Iraq's People, a coalition of Sunni groups. Killed at the scene of the abduction was Carroll's Iraqi interpreter, Allan Enwiyah, 32, who was reportedly shot twice in the head. Carroll's driver, who has asked not to be identified, said that one of the kidnappers pulled him from the car and sped off with Carroll and Enqwiyah. The Christian Science monitor reports the driver as stating that a remaining kidnapper shouted at him to "get away," and shot at him before he was able to run off towards safety. CNN reports the driver as saying, "It was very obvious this was by design. The whole operation took no more than a quarter of a minute. It was very highly organized. It was a setup, a perfect ambush." 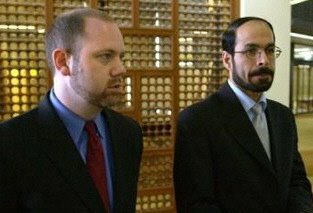 Awad and CAIR Government Affairs Director, Corey Saylor, had hoped to meet with Iraqi Muslims in person to explore ways to win Carroll's freedom but their mission fell short of expectations due to lack of safe transport into the city, forcing a default to telephone conferences. "We hope that the combined efforts of all those who are concerned about Ms. Carroll's safety will result in her immediate and unconditional release," said CAIR Board Chairman Parvez Ahmed. "The American Muslim community is committed to doing its part in helping to win her freedom." CAIR has its share of naysayers, but let us consider the words of Jill Carroll on why she was willing to put her life on the line in Iraq, "Covering the war gives journalists an opportunity to recall the noblest tenets of their profession and fulfill the public service role of journalism." Imagine a world filled with other Muslim representatives, organizations and even individuals like Jill, willing to stand up for the noblest tenets of their faith and to fulfill the public service role in propagating the true message of Islam. We can't expect the media to stop misrepresenting Muslims and Islam until there are enough of us willing to demonstrate by action and deed something other than the negativity they so lavishly propagate; and until there are enough of us who are bold enough to say, "We're not going to take it anymore." Islam's Stance Against Terrorism Islamic Statements Against Terrorism Muslims Condemn Terrorist Attacks Related: Stories by Jill Carroll 'What a Way to Make a Living' Old brutality among new Iraqi forces Sectarian strife tears at neighbors Violence threatens Iraqi coalition Iraq's rising industry: domestic kidnapping Iraqi women eye Islamic law Patchwork of progress and perils in Iraq 6 miles to the airport: The toughest commute in Iraq Ordinary Iraqis bear brunt of war An American activist who dared to help Iraqi victims On the Net: U.S. Hostages in Iraq American Islamic Group Heads to Middle East to Plead for Journalist's Release Michigan Group Appeals for Release of Kidnapped Journalist CAIR Delegation Arrives in Iraq to Plead for Reporter's Release MI: Pleas for Carroll's Release Continue MI: Muslims Step up Effort to Free Hostage MI: Muslims Work For Journalist’s Release CAIR Urges Release of US Journalist in Iraq Image © AP/Mohammed Hato Copyright © 2006 Aishah Schwartz Permission is granted to circulate among private individuals and groups, to post on Internet sites and to publish in full text and subject title in not-for-profit publications. Contact author for all other rights, which are reserved. This issue is breaking my heart.I really hope that a solution is found and they release her. Thanks for the update. You are a really talented writer mashallah. Very thorough report. I love the links at the bottom. Very helpful in understanding this situation. I am praying for her release soon and peace for her family. These types of things are hard to understand when and why they happen. So I pray and leave it up to our wise Allah for a quick return and her safety. Good news. I wish these sort of stories would make more news in the Western media. They seemed almost obssesed with anything negative about Islam. Too bad that we, as Muslims, are giving them so much material. I just watched the video clip on yahoo of her speaking. I thought it was awsome how she stressed the point that she was well taken care of and how important it is for others to know that... I like her creating peace technique. Alhumduallah she is safe and may Allah reward her for speaking up about the good care she received instead of saying things that would creat more hatred towards Muslims, may Allah reward her..